The image you’re looking at is a rare and beautiful event. Every 115 years, Venus crosses our Sun in Earth’s line of sight—twice. And when the most recent crossing took place, scientists used the event to take a peek at Venus’s atmosphere, refining tools that’ll one day help astronomers search distant worlds for signs of life. Scientists have used transit events—in which a planet crosses in front of its star from our perspective on Earth—to spot thousands of extrasolar planets over the past decade. But most of the planetary transits we witness are taking place tens to hundreds of light years from Earth. All that our telescopes really see is a faint dip in a star’s light as the shadow of a planet flutters across its path. But Venus is our nearest neighbor, lying anywhere from 24 to 162 million miles from the Earth. The transit of Venus across the Sun is quite literally the best such spectacle we’re gonna get. When this transit took place on June 5, 2012, NASA’s Solar Dynamics Observatory and the Japanese Aerospace Exploration Agency took pictures of the entire event in several wavelengths of light. Now, by studying images of the backlit planet crossing our sun, astronomer Fabio Reale and his colleagues at the University of Palermo have worked out what sorts of molecules and atoms are present in Venus’s atmosphere. In the future, astronomers will use the very same technique to hunt for signs of life on planets in faraway star systems. 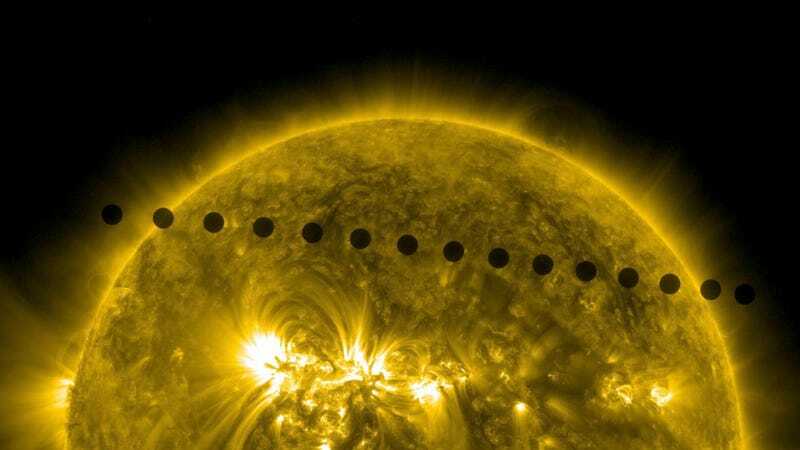 As described this week in Nature Communications, the researchers looked at several images of the Venus transit, taken in x-ray and ultraviolet wavelengths. For each set of pictures, the team calculated how much atmospheric blocking was taking place—that is, how high in the planet’s atmosphere a wavelength of light was being absorbed. Since different atoms absorb different wavelengths of light, atmospheric blocking tells scientists how many and what types of molecules are present in the layers of a planet’s atmosphere. Future missions, beginning with the James Webb Space Telescope in 2018, will have the powerful optics needed to catch the light filtered through the air of distant worlds. The “spectral fingerprint” of these planets atmospheres will help scientists work out what exactly they’re made of. And if we find a few key ingredients—say, oxygen, water, and methane—we might just have found ourselves a second Earth. Venus’s transit may be stunning, but it’s paving the way toward what could be the most important scientific discovery of the century. Read the full open-access paper at Nature Communications.